Most pop-rock albums of the early 1960s were not conceived of as long-playing recordings, instead throwing on a hit or two with a bunch of quickly recorded filler. 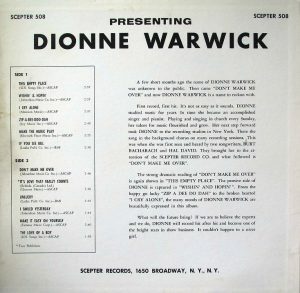 But while several of the songs on Presenting Dionne Warwick did show up on her early singles, her debut LP was anything but a padded affair. In addition to featuring her first hit single, “Don’t Make Me Over“, it contained no less than eight other compositions by the hallowed songwriting team that would supply most of her 1960s chart 45s, Burt Bacharach and Hal David. 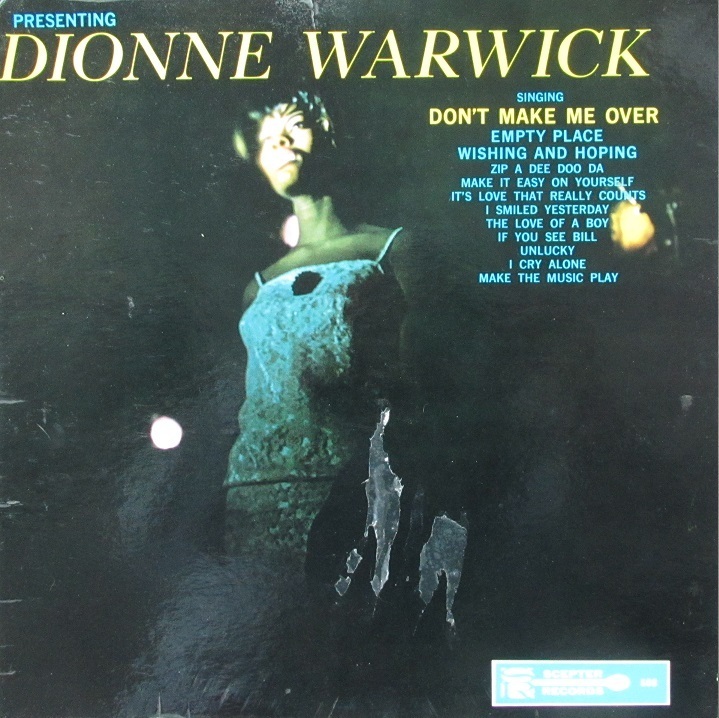 And though “Don’t Make Me Over” would be the only high-charting entry in the Billboard singles charts, a couple of the other songs would become hits in the hands of other artists, though Warwick’s interpretations remain first-class. 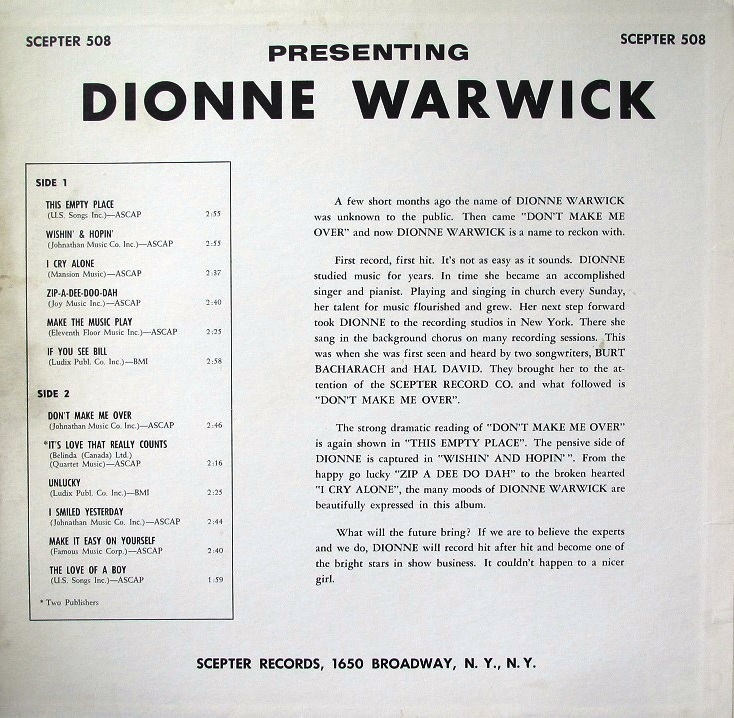 The aptly titled Presenting Dionne Warwick (1963) was the vocalist’s first long-player and quickly established the artist as a suitable vehicle for interpreting the quirky pop melodies of Burt Bacharach(music) and Hal David (lyrics). She met the pair during the summer of 1961 as a background singer during the recording session for the Drifters’ minor hit “Mexican Divorce“, which had been penned by the lucrative pair. Their initial outing, “Don’t Make Me Over“, became the first of the alliances between Warwick and the songwriting team to hit the pop chart. The prolific nature of this collaboration resulted in Bacharach and David providing three-quarters of the tunes on this dozen-track album. Interestingly, despite having hits almost instantaneously, Scepter Records co-founder Florence Greenberg initially rejected “Don’t Make Me Over” until it began to outperform “I Smiled Yesterday“, which had been chosen as the A-side. It was not only her first hit, but in time it likewise distinguished itself as a signature catalog entry when it crossed over onto both the pop and R&B charts, respectively. Warwick’s inviting voice was at the core of their successful working relationship, coupled with the undeniably unique and expertly crafted material, yielding a host of classics such as “Wishin’ and Hopin’“. The version here predates Dusty Springfield‘s rendering and was likewise much of the reason Springfield chose to cover it to begin with. 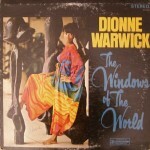 Other seminal entries featured on Presenting Dionne Warwick are “Make It Easy on Yourself” and the lovelorn melancholy ballad “I Cry Alone“, as well as the unique arrangement of “Zip-A-Dee-Doo-Dah“. In 1995, Sequel Records began reissuing vintage Warwick LPs, pairing Presenting with the 1964 follow-up, Anyone Who Had a Heart, on a double-play CD.